Abus are fairly new to the helmet game but they've quickly made a name for themselves as a producer of good quality lids and the S Force Road is no exception: it's a well made mid-range helmet for general purpose riding. The S Force Road is, as you'd expect, mainly constructed from EPS foam with an in-moulded hard shell which covers most, but not all of the helmet's outer surface: the rear vents have no shell. The retention system is simple and effective with two ratchet clips allowing for a good range of head sizes. Internal padding is well placed and comfortable, though it's not the thickest. 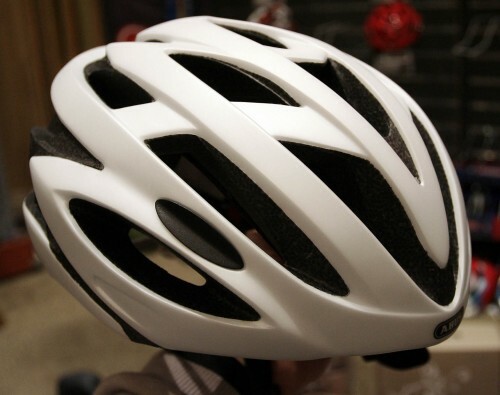 There's 24 vents to keep you cool as well as air channels within the shell to move heat away from your head. The buckle has a chin pad included which is a nice touch, as is the reflective on the rear vents. Abus test their lids to the European EN1078 standard.